When I got my Amstrad in 1984, it came with one game: Roland on the Ropes. 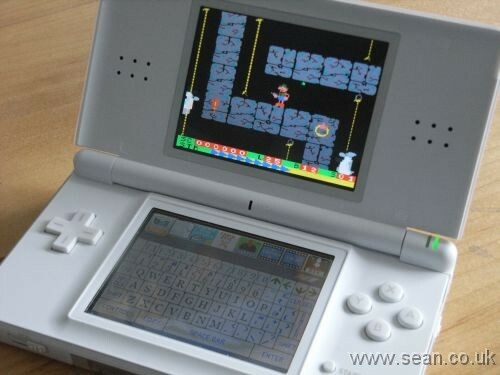 When I finally got an Amstrad emulator running on the Nintendo DS, it was one of the first games I tried. The game seems remarkably easy now, compared to how I struggled with it as a kid. But like many games from the Amstrad era, it plays as well on the handheld as it did on the chunky CPC. There are lots of well-loved games from the 80s that never had an arcade following large enough to justify a commercial remake today, and wrestling with an emulator is probably the only way you'll ever get to play them on the move. Nintendo doesn't approve of homebrew, as a rule. One reason is that they want a slice of all the game sales revenue, and want to keep some control over quality. Another reason is that if people learn too much about how to copy files to the DS, they might learn a thing or two about piracy along the way. So getting the emulator running wasn't easy. The first ingredient was Datel's Games'N'Music. This is an unofficial homebrew cartridge, and probably the easiest to get hold of. You can buy Games'N'Music on Amazon and can probably order it in most game shops. It includes software for converting video and MP3s to the DS, and a small selection of homebrew games. If the words 'Cassette 50' mean anything to you, you'll have a rough idea of the kind of standard of game we're talking about. With no disrespect to the authors, who have climbed technical mountains to create some good-looking titles, the games don't really have the kind of complexity you might expect today. One reason for that is that until recently, software running on Games'N'Music was unable to use the file system. With all homebrew carts, you need to patch the software in so that it knows how to use the file system on the cartridge you're using. A DLDI driver (as it's known) for Games'N'Music wasn't available for the Nintendo DS until last summer. Now that it is available, much more sophisticated homebrew can be run from the cart. Much of the stuff I've tried still doesn't work, but the good news is that an Amstrad emulator does. The emulator I've used is called CrocoDS. To get it working, you patch it using the DLDI tool, and then copy the emulator software and Amstrad games to a MicroSD card that comes with the Games'N'Music cartridge. This is a simple drag and drop operation using the USB MicroSD reader that comes with Games'N'Music. The MicroSD card then locks into the main Games'N'Music card, which is like a standard NDS cartridge (although mine broke and I've had to tape it to keep it in). To get it working, I had to copy both the emulator software and the games to the root level of the Games'N'Music cartridge. Then, you're ready to play. The Games'N'Music interface is extremely unresponsive, but if you keep poking the CrocoDS icon, it'll eventually start. And from then on, everything runs smoothly. You can insert .dsk emulator images or .sna memory grabs. Because of the size of the screen, mode 0 works best (chunky and colourful, as seen on Chuckie Egg and Get Dexter). Mode 1 (Batman, Knight Lore etc) works well, although you might lose some definition. Mode 2 (mostly used for word processing) is virtually illegible. There is an option to view the CPC screen without scaling, but you can't scroll the area viewed, so you lose the right hand side and bottom of the screen. The sound is faithfully reproduced, although in some games it runs at half speed for some reason. It seems to be the older games that are affected, so I wonder whether it's the games that were developed for the CPC464 that sound odd since the volume parameters changed for the later machines. The strange sound doesn't affect gameplay, in any case. The touchscreen has a virtual keyboard, including sticky shift and control keys (so you don't have to hold them down while pressing something else). This works fine, including for adventure games. For action games, the most useful feature is the joystick and cursor key emulation on the direction pad. The A button acts as a fire button when the joystick is being emulated. The D-pad doesn't work quite the same as a joystick - the diagonal controls don't seem as smooth, but in most games that won't matter too much. Because the D-pad can work like the CPC's cursor keys, you should be able to play pretty much any game with a redefine keys option by redefining the keys to the cursor keys. Sadly, there are some games, including one of my favourites Advanced Pinball Simulator, which aren't playable by joystick and don't have a redefine keys option. This emulator is a fantastic addition to anyone's library. You can play classics such as Jet Set Willy, Chuckie Egg, Manic Miner, Highway Encounter, Android II, Spindizzy, Dizzy, and many more. If I didn't already have a DS, this emulator would be a good enough reason to buy one. It's a bit fiddly getting it working, but it's well worth the effort. 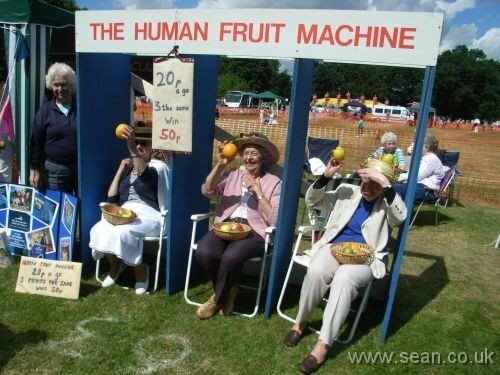 I hadn't seen a human fruit machine before, but it's something of a staple for the village fete around here. I took this summery photo a few weeks ago. Based on my experience publishing my novel University of Death through Lulu.com, I've written twelve tips for self publishers on using Lulu.com. I hope they will be useful to people who are considering working with the site, or to those who are in the early stages of planning their publications. If anyone's got any questions about using Lulu, let me know and I'll update that page with responses to those questions. Sticking Space Invaders to my wall They look awesome, but it's very fiddly unfurling them if they stick to themselves. Get some but be careful. Seeing David Gilmour and Ron Geesin perform Atom Heart Mother The extended sections were great and the choir and brass sounded fantastic. It was a thrill to be one of just 900 to witness David Gilmour perform this for the first and probably only time during my own lifetime. Seeing Roger Waters perform Dark Side of the Moon at the O2 Great show, but odd since the star only plays bass on most of it. The solo stuff worked better in many cases. After trying to get a ticket for months and only being offered crap seats, I picked up a first class seat two days before the gig, through Ticketmaster. 'Sold out' gigs are never really sold out. Ripping vinyl Some great stuff has never been issued on CD, including a lot of Prince 12"s. Being able to move music between media like this and enjoy the sounds I paid for some years ago is a good argument against DRM. Use Audacity. Ripping tapes Having a tape deck fitted in to your PC is the next big thing. For former walkman fans like me, it's an easy way to digitise all those albums I bought on tape and haven't re-bought on CD yet, and all those home recordings I made. I won my tape deck in a joke competition. Gardening We've got an allotment now. It started off with knee-high grass all over it, but we're slowly reclaiming it. This year we're growing courgettes, sweetcorn, cabbages, and rhubarb there, and in the garden we have squash, tomatoes and herbs. Cats are evil. The novel World War Z by Max Brooks This account of the Zombie war is written as a series of interviews with survivors. While the lack of a central hero or recurring character means it jumps around a lot, it is a great way to convey the scale of a planet under siege. An engrossing story, and an interesting format for fiction.